When planting zucchini it is important to consider the space needs of the mature plant. Zucchini can grow to a width of 1.5 x 1.5 so will need a large space to allow for the mature plant. Because of their susceptibility to mildew, leave enough space for good airflow around the plant and place in position that will get 8 hours of full sunlight. Each plant can produce between 3-5kg of zucchini per plant over a season so when considering how many seedlings to plant stagger plantings to avoid large gluts of fruit maturing all at once. Zucchini can be started in seedling trays in September and the seedlings transplanted in November and December. In warm weather seeds sow seeds directly into the garden to a depth of one and a half times the size of the seed. As zucchini are shallow rooted plants they need a well draining, rich soil that will hold moisture in the growing period. Whilst they need plentiful water it is important that zucchini plants do not become waterlogged. Prepare the site for planting by digging a hole about 60cm deep and fill with 30cm of good quality compost and well rotted cow manure. Backfill with soil to create a mound. Plant out the seedlings in a handful of compost in groups of three, planting into the mound and later thin to the strongest plant. Mulch the soil well around the plants once they are well established to ensure the moisture is kept in the soil around the roots. 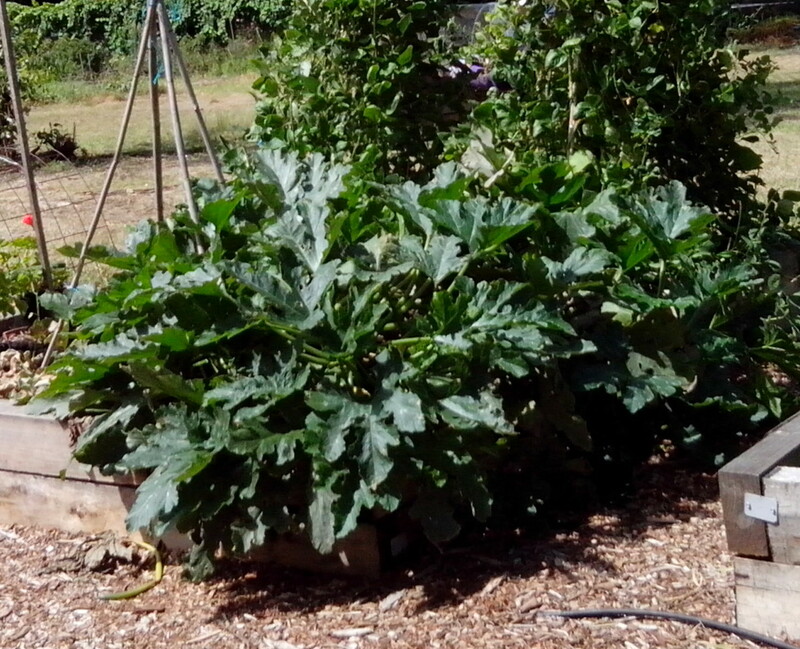 Adequate water is needed at all stages of growth but at the time of fruiting water needs will be increased for good sized zucchini. They will need about 2-3in of water per week, watering at least twice a week or more in really hot conditions, to an area about 90cm around the plant, as the feeder roots spread close to the surface of the soil. The ideal is to keep the plant evenly moist. Fertilize regularly with compost tea or fish emulsion to promote growth. As zucchini are heavy feeders use a side dressing of well rotted compost if leaves show signs of yellowing. 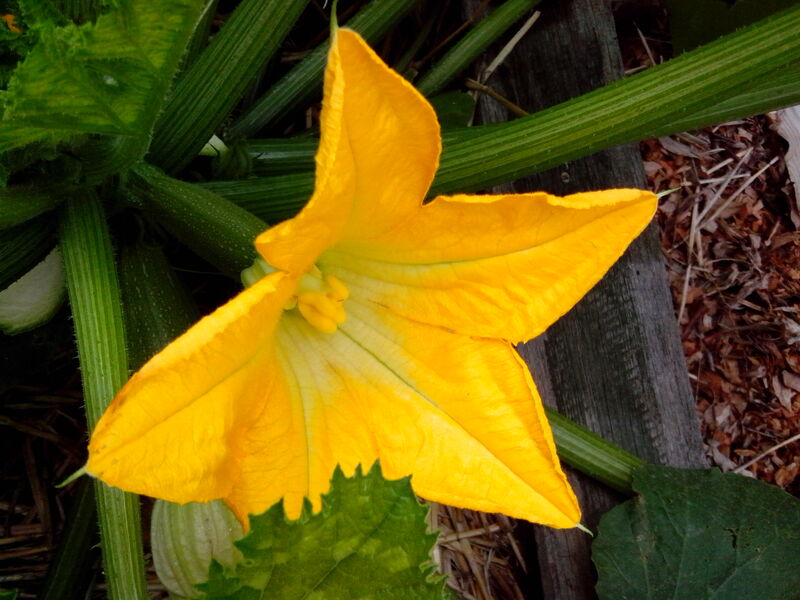 Plant borage, nasturtium, marjoram or sweet corn in the beds nearby to attract bees and aid in the pollination of the zucchini flowers. The zucchini should be ready for harvesting in about 6-7 weeks and will need to be picked continuously by cutting them away from the stem when they are about 15cm long. Continued picking will encourage more fruit to form and extend the life of the plant. As the fruit is fast growing plants should be checked for harvest every day. Here is a link to some recipes you might like to try when you have an abundance of zucchini to consume.